We drove through South Africa for 5 weeks and highly recommend it to everyone! 1. Gas Up. Be aware of your gas tank gauge and top up on petrol when you see a station. We were dangerously low on fuel one day and thought there would be a gas station coming up, but it was much further away than we had thought. You don’t want to be stuck out on the roads here, so keep an eye on the amount of gas you have. If you’re driving for long distances or going off the main roads, make sure you have enough gas! 2. Older Is Better. You don’t want to have a flashy, new looking ride while in South Africa. Nice cars = money. If given the choice between a BMW and a Chevy, go for the Chevy. 3. Don’t Pick Up Hitch-hikers & Don’t Stop For Anyone. We were told this numerous times by the local people. 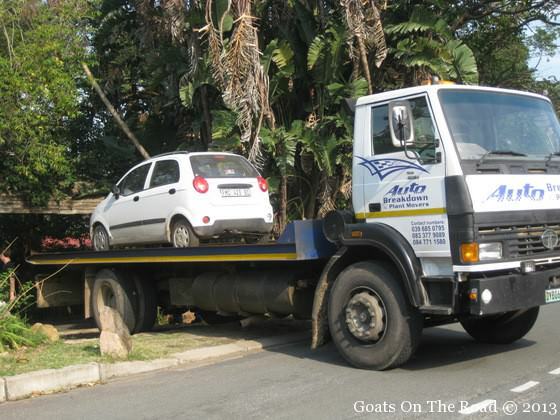 There are scams in South Africa targeted at drivers. Someone will act as though they need help with their broken-down vehicle and as you pull over to help them out, their friend jumps out of the bushes and steals your car, and/or robs you. Stop for no one. 4. Lock Your Doors. Always lock the doors to your vehicle, even when driving. Again, you could be a target for a robbery or carjacking when you pull up to a stop sign or a red light. 5. Don’t Drive At Night. Figure out how long it will take you from where you are to where you want to go, and then leave early enough to make it there before dark. Being out on the road in South Africa at night can be a dangerous place. There are even laws that say you can run a red light or a stop sign at night, due to the high number of carjackings! This is probably the fastest anyone has changed a flat tire! Good thing we were driving during the day when this happened…. 6. Watch Out For Pot Holes! The main roads and highways in South Africa are really good. 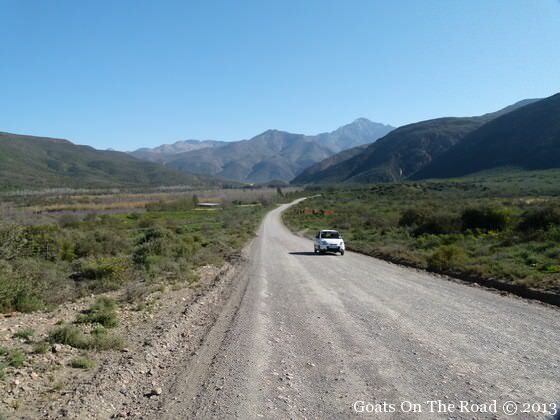 However, when you get off of them and are heading to some smaller towns and villages, the roads can be quite poor. The potholes become more like canyons, there’s no shoulder and many people are walking along the roads, so you have no choice sometimes but to hit the craters head on. Our car was the victim of 2 massive potholes. 7. Pay The Parking Attendant. When you go to a grocery store, restaurant, shop, mall or anywhere like that, there will almost always be a man standing outside wearing a neon vest, who will say “watch your car?” Basically he keeps an eye on it while you’re away and makes sure no one vandalizes or steals it. He may even top up the parking meter for you! When you get back to your car, he will ask you for some money, typically about 2-5ZAR is appropriate. 8. Have A Mobile Phone. If you have a breakdown, are lost, need to call the rental company, or have an emergency, having a mobile phone is a must. It’s not a good idea to get out of the car and wait on the shoulder, stay in your car with the doors locked. 9. Get A Cooler (Ice-box). It’s a good idea to always have some food and water in case of breakdowns, or if you get lost! Being able to keep food cold while on the road is awesome. We had cheese, leftover dinner, cold chicken, fruits and veggies and of course, cold drinks. 10. Have A Good Map. Having a good map is key to your road trip experience. 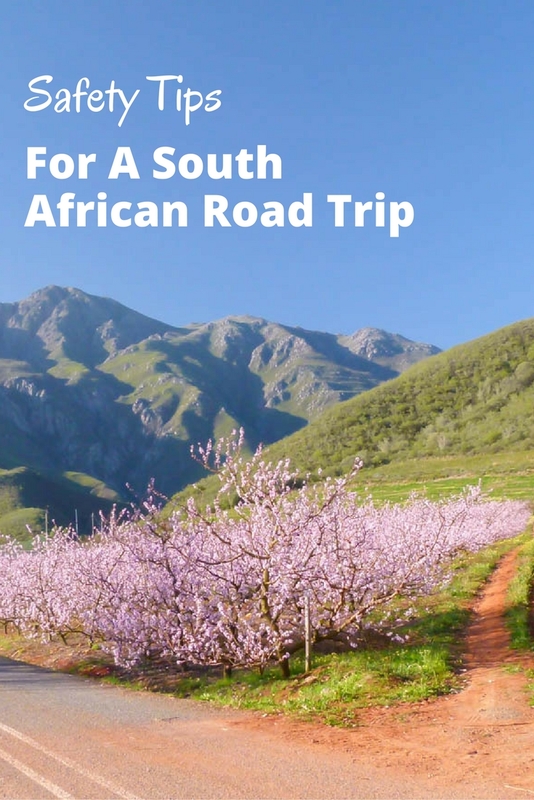 There are so many different routes you could take in South Africa. By having a good map, locals can show you the most scenic and fastest routes from point “a” to point “b”…and of course, you won’t get lost. 11. Windows Up. One of the great joys of driving through South Africa is seeing the beautiful landscapes and feeling the wind blowing in your face. Which is what you should do, until you arrive in the city, then it’s time to put the windows up, and turn the air conditioning on! Having your windows wide open makes it easy for someone to reach in and steal something. 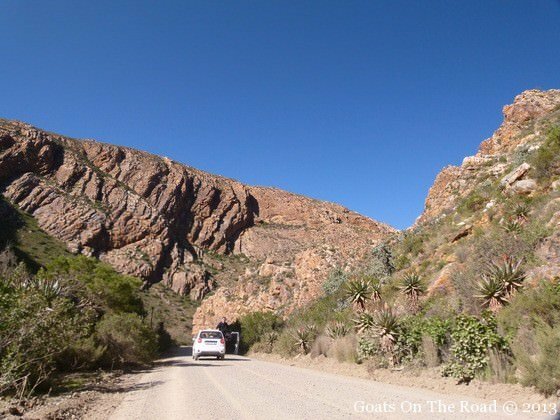 Enjoying the beautiful views in South Africa with the windows down…once in the cities, windows up! 12. Watch out for wildlife. Livestock and wildlife often roam the roads here. Be aware! You don’t want to go head-on into an antelope, you’ll lose. 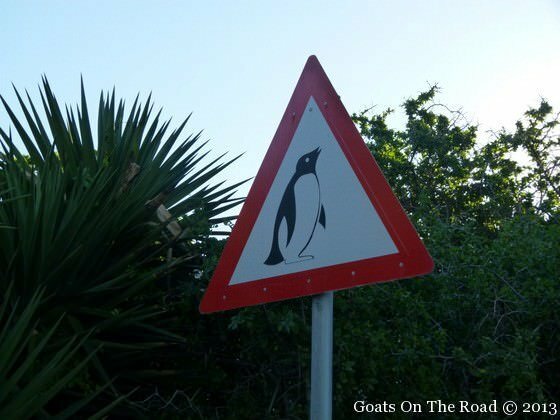 Watch out for wildlife on the road! There you have it. Some great tips to help keep you safe while driving in South Africa. 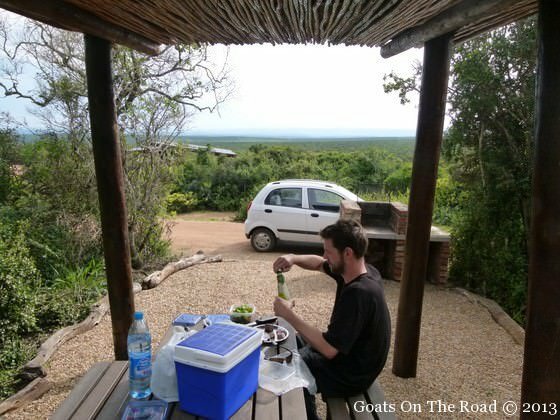 Having said all of this, we spent 5 weeks in this awesome country and drove from Cape Town all the way up the coast to St. Lucia and veered into Swaziland before ending our trip in Pretoria. 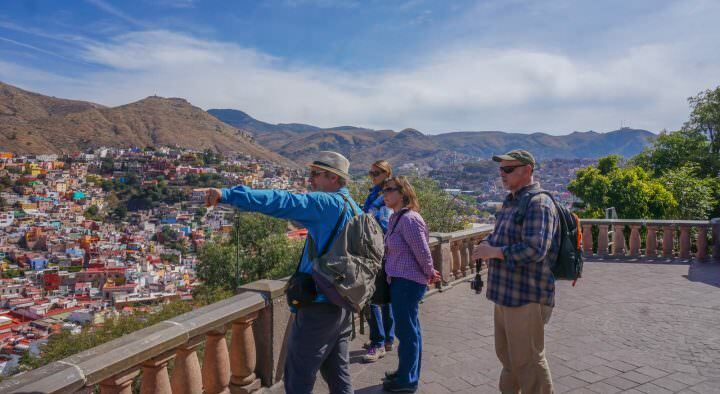 We had nothing but great experiences and if you follow these guidelines, you will too! Rent A Car With Carhire3000. 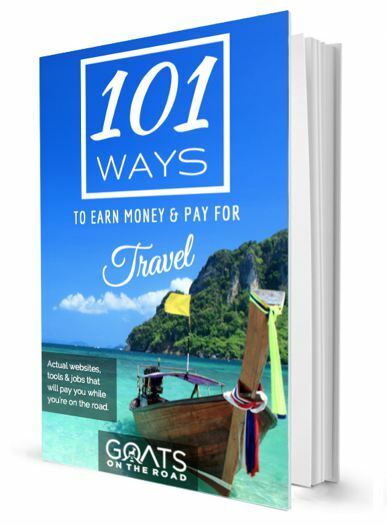 We found this online company to be professional, prompt and easy to deal with. 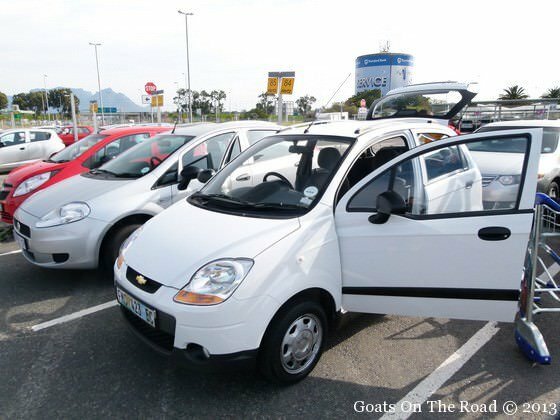 We ended up getting a Chevrolet Spark car, with insurance (including windshield and tires), drop off in a different city than the pick up all for $25/day. We loved our little Chevy Spark. It was good on gas, and having 4 doors made life so much easier when it came time to load up the car. 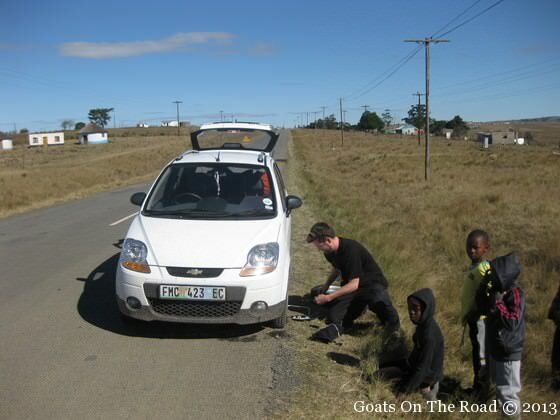 Have you ever done a road tip in South Africa? Did you feel safe? Leave a comment below! SOUTH AFRICAN SAFARI: NATIONAL PARKS YOU CAN AFFORD! We love your blog! 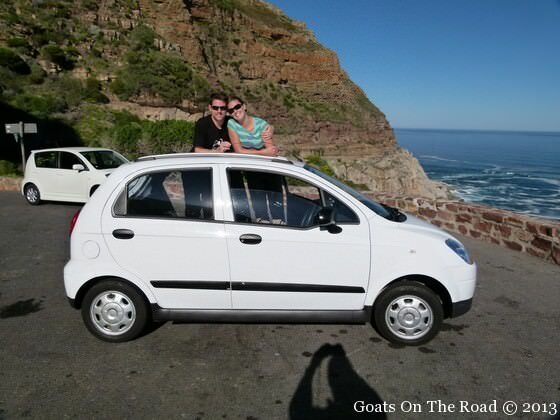 We are currently planning a road trip through South Africa and are evaluating cars to rent. We appreciate the advice that cheaper is better. Two questions: 1) How difficult was it to learn to drive a manual car with everything reversed from what you are used to at home? ; and 2) Did your Spark have room to “hide” all of your luggage while you were underway – from a security perspective, did you feel this was necessary? That’s so exciting that you’re about to embark on a trip through South Africa! So fun. It was a bit difficult to figure out the gear shift, but Nick drove around the rental parking alot a few times until he felt comfortable and then took off. We had no issues with forgetting what side of the road we were on or anything like that! As for hiding your gear while you’re driving, we felt it was a good idea. The Chevy had enough room in the “trunk” to put our bags and we just had the ice-box (cooler) on the back seat stocked with snacks and water. Thank you so much for your reply, we greatly appreciate it. We leave April 1st and are in South Africa for about 7 weeks. Your blog was really an inspiration for this trip. And yes, my husband is quite handy at basic maintenance items so we are good there (not my strong point!). 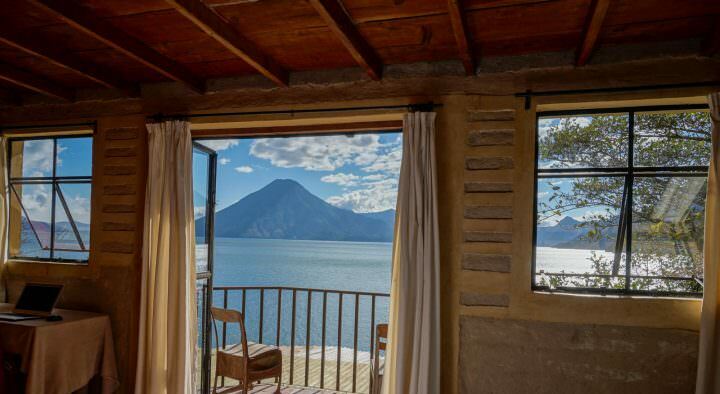 Happy travels to you in Mexico! We didn’t find that we went on many short walks away from the car when driving. We made many pit-stops, but we could drive to most of them and have a view of our car from there. Just make sure to lock the doors and leave your belongings in the trunk (the boot) so they aren’t visible. The main issues with robberies are during the night and in bigger cities. If you’re in the middle of nowhere doing a walk, I’m sure your stuff would be fine. Great site, love the content!! We are heading to South Africa and would like to rent a car for a month also. Where did you pick up and drop the car off? Using the link provided they continually say they don’t have any cars available in Johannesburg or Cape town which I find very odd? 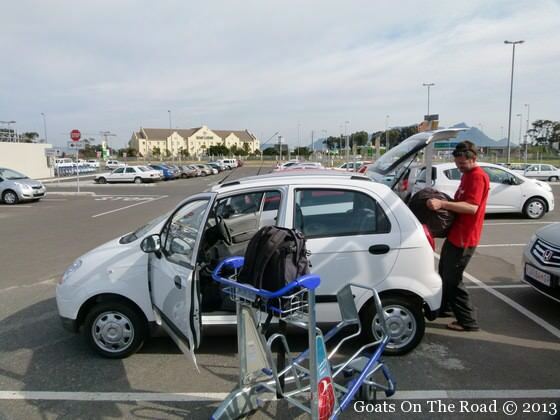 In any case renting a car in a foreign country is preferable. When taking into consideration how much you are driving during that time, you see that car rental costs are not so much. clever work and reporting! Keep up the great works guys I’ve you guys to blogroll. I like thhe valuable information you supply in your articles. I’m moderately certain I will be informed a lot of new stuff right right here! Hi. I am a South African enjoying your website so I thought I would throw my two cents in in answer to people’s questions. First off about leaving possessions in an unattended vehicle. As long as your stuff isn’t visible it’s probably fine. Especially don’t leave phones, wallets or computers lying on the seat. Where possible park in less isolated areas. Regarding the smaller car – I don’t know if this is vital. A huge number of South Africans drive SUVs, the rationale being that you might need them if you are travelling in rural areas where the roads could be bad. 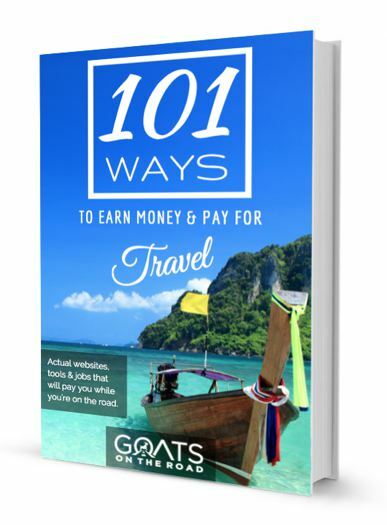 You certainly won’t be spotted as an obvious tourist if you choose something commonplace and not especially high luxury like a Nissan X-trail.